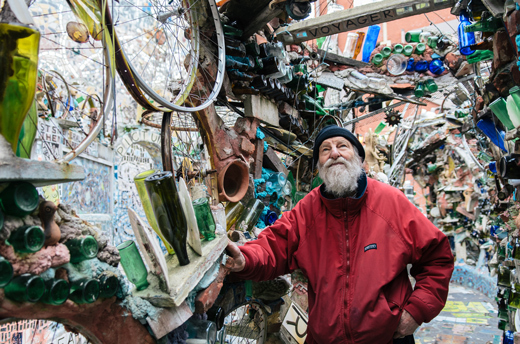 Preserving Magic: Can Philadelphia protect Isaiah Zagar's dazzling folk art? story and photo by Dominic MercierThis article is part of a special editorial partnership with Hidden City Daily on preservation in Philadelphia.Like what you read? Check out the full March 2013 issueand visit Hidden Cityfor more stories on the inspiring preservation work being done in Philadelphia. While Zagar now owns the three main lots, protecting the Magic Gardens is no easy feat. The roughly 50,000 square feet of murals are made from pottery, glass and found objects. They climb over walls (both inside and out), cover shops, alleys and private homes, spreading from the central Magic Gardens site across nearly 33 Philadelphia blocks—much on private property. One tool for preservation may be the creation of a “Zagar zone of protection,” an idea posited by Sarah Modiano, a Columbia University preservation student. Modiano sees Zagar’s work as a singular visionary art environment like Los Angeles’ Watts Towers and Brooklyn’s Broken Angel. Those works—which are discrete sculptural installations—have been named national landmarks and thus, given nominal protection. But Owens notes that preserving Zagar’s oeuvre, which is largely integrated in the fabric of the neighborhood, will be a challenge. In addition to the whims of property owners, the work is subject to seasonal expansion and contraction from rain, sleet and snow, as well as the eager hands of visitors. And because of the diverse materials there isn’t a single straightforward method for conservation.